Turion duckweed, or red duckweed, is a native species in North America that is found in eutrophic (basic) quiet waters. It is found across the continent but is not reported, so far, in southeastern US states or in parts of the Arctic (USDA Plants Database 2010). It was collected twice in BC in 1978 by John Pinder-Moss (Hatzic Slough near Mission) and since then has been collected from several locations (south of Fort Langley, Deer Lake in Burnaby, Chilliwack, Hatzic Slough, Silverdale, and Swan Lake in Victoria. Turion duckweed closely resembles common duckweed (Lemna minor). However, fronds are flat, more symmetrical, thinner, and are reddish coloured on the lower surface, unlike common duckweed. Additionally, Armstrong (2010) says L. turionifera has "a row of minute papules along the midline which are absent in L. minor". This is the only Lemna species that produces turions (overwintering buds). 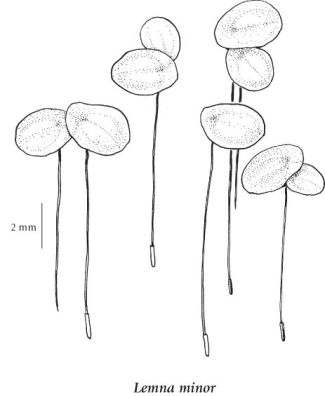 A detailed species description is provided in Flora North America. Additionally, Wayne Armstrong provides detailed taxonomic information for separating species in the Lemnaceae, as well as many good photos. Turion duckweed is now present and invasive in Europe. 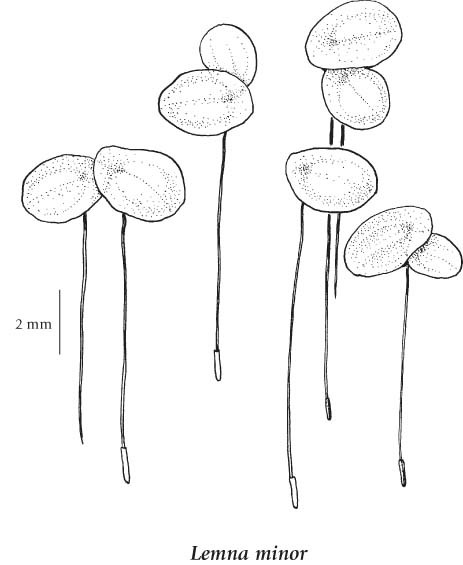 Fronds annual, free-floating, usually in pairs, elliptic, rounded or broadly egg-shaped, 2-6 mm long, unstalked, quickly becoming detached, obscurely 3-nerved, the young plants produced from a pair of marginal pouches near the base of the frond. The separation of L. turionifera from L. minor, based on characters which are usually absent in BC or are sometimes found in L. minor, is not practical in this flora. Lemna turionifera has dark green or brown winter buds and fronds which are 3- to 5-nerved and purple-red beneath. Ponds and slow-moving streams in the lowland, steppe and montane zones; common throughout BC south of 55degreeN, less frequent northward, absent in NW BC and rare in the Queen Charlotte Islands; circumpolar, N to AK, YT and NT, E to NF and S to FL, MS, TX, NM, AZ, CA and MX; Eurasia.